There are good cops, and there are bad cops… and then there’s Denise. From page 20 of the Tron ni Kobun Secret Encyclopedia (the reverse section of the Tron ni Kobun Treasure-Trove Guide book), we present Gold City’s finest: the Ryship Police. A member of the police force that protects the peace on Ryship Island. Her sense of justice is strong, and she’s always full of enthusiastic spirit. However, she’s still just a novice officer who has trouble getting to work on time, and she’s had her fair share of blunders already. She’s not very skilled at operating mecha, either. She has plenty of spirit, but not much composure. Tron is always getting the best of her, can you tell!? Her enthusiasm is sadly matched by her patheticness. She looked like this at first!? 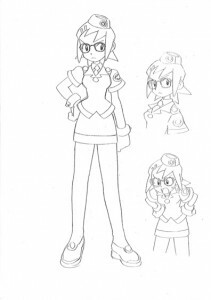 This was how Denise’s design first looked. Her expression is a bit scary compared to how Denise appears in the game now. Here she actually looks sort of haughty and self-important. Denise’s fellow officers. Though valiant and courageous, it seems they are simply no match for the likes of Tron. 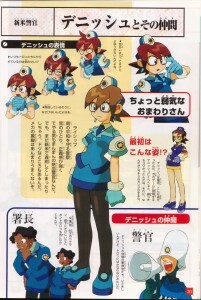 The female Police Captain. 46 years old, and a veteran on the force. She can be very stern with her subordinates, but the truth is it’s just because she always worries about them so much. As a bungling and rather clueless cop who tries hard and fails even harder, Denise can really steal the show. 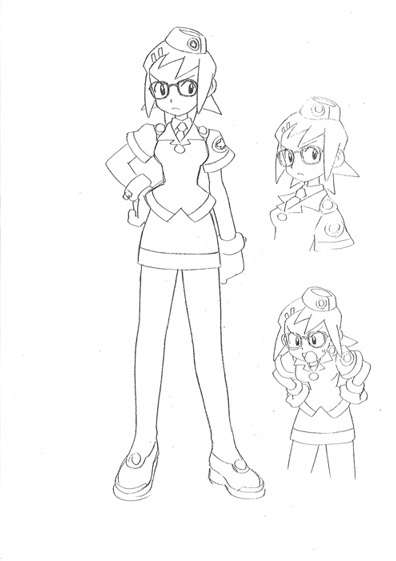 In The Misadventures of Tron Bonne, her unlikely duties have pitted her (rather unfairly) against the forces of the Bonne family air pirates. And though she’s frequently out-matched and out-gunned, she refuses to give up time after time. Ever the ne’er do well, even Tron can’t help but feel a certain soft spot for her. After all, the Bonnes share the same tenacity! 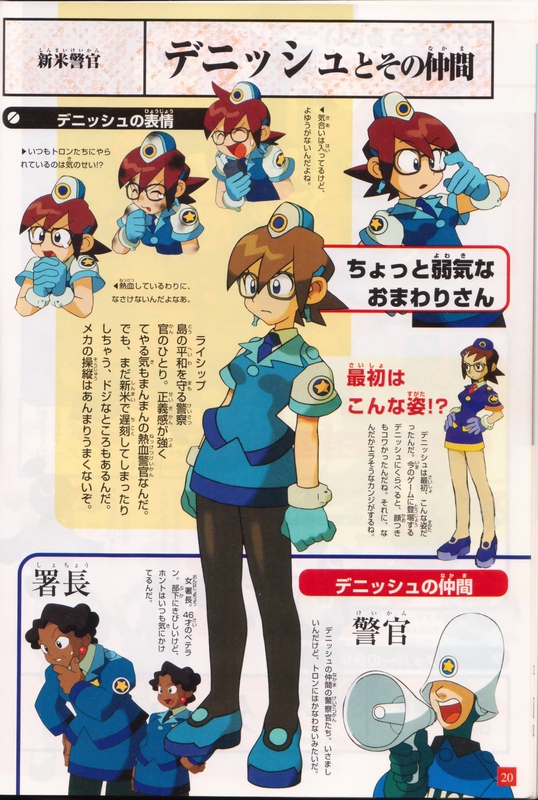 Denise’s name is almost certainly a reference to food, since her last name is Marmalade and her first name in Japanese is the same pronunciation as the word “danish“. Interestingly, these foods have a more of a United Kingdom or European connotation, as do the style of uniforms and “bobby” hats worn by the other officers. Denise has made a few other appearances, too. 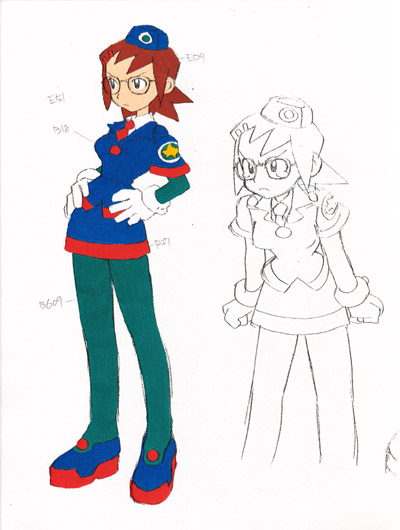 After Misadventures, she made a second game appearance in the Capcom mobile title Rockman DASH: Great Adventure on 5 Islands! 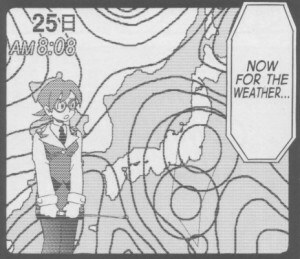 You may have also seen her weather girl cameo in Hitoshi Ariga’s Mega Man Megamix, shown above. Will Denise be appearing in Legends 3, helping control the biker gang activity at the behest of Aero’s chief-of-police father? 9 Comments to "Lady Marmalade"
Purple and gold scheme, it’s in the first image on the right side. That purple looks more like navy blue to me. It’s probably closer to a crayola color called “Denim.” With yellow, that’s one of my favorite color combinations of all time. Denim? I like the sound of that! 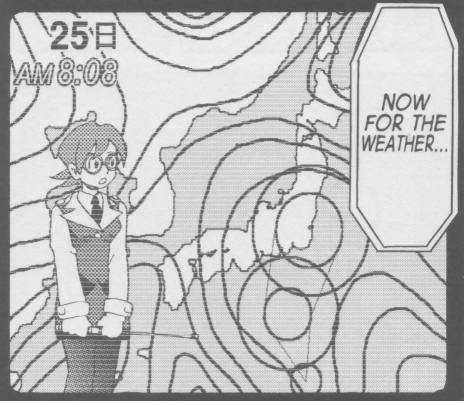 The scan may have come out a little lighter than in the book. Those colors really caught my eye at first, glad you like it too! :] And that shade of yellow, according to Crayola, is called Dandelion. My most-used crayons could’ve wound up becoming Denise’s main color scheme! Maybe another character will get that scheme later down the line. Max kind of comes close with a very distinctly purple suit. I always forget…how ridiculous their hats look. She also lives at home with her mom. « The Fine Art of DASH2, Starring #20!